Animal enthusiasts will be overjoyed by the cute kittens and puppies on display in the latest online slot Purrfect Pets from the software producer Real Time Gaming. This much-anticipated slot launched at all RTG casinos on May 17, 2017, and will be available across multiple platforms including mobile and desktop channels. Be prepared to discover a good range of features like Wilds, Scatters, Free Spins, Multipliers up to 30,000x stake, Random Progressive Jackpots and Bonuses when indulging in a game of chance in this feline fraternity and canine camp. New Purrfect Pets Slots is a 5-reel, 25-payline progressive bonus video slot. The online game consists of two jackpots, a Major and a Minor. These jackpots are set off randomly, and the progressive jackpots can be won at the end of any game. The top award is 30,000,000 times your wager per line! The coin denominations range up to $25. Taking into consideration the huge jackpot, you may want to stake the max. The game's artwork is sure to prove controversial, as it has a cutesy look and feel to it. The reels are set in a bright and vibrant cartoon world and have a bunch of cute symbols. The Puppy symbol acts as the scatter and wins obtained are multiplied by your total wager. The Cat acts as the wild and will substitute all other symbols except the scatter. Other symbols include: a baby bottle, a dog bone with a blue ribbon, a Yummy dish, Purry Yummy Cat biscuits, a toy mouse, a blue collar, and the most adorable kittens and puppies you've ever seen. All of them are wide-eyed and quite happy. When you obtain three or more scatter Dogs, you will be rewarded with 10 free spins. All wins are doubled. All scatters will act as wild symbols. If you obtain three or more scatter Dogs or three or more scattered Cats, you will win an additional 10 free spins. Prizes in the free spins round are tripled when one or more Cat wild symbols appear in a winning combination. Cats vs. Dogs Feature is a random attribute that may be activated at the end of a standard game that does not activate the Doggy Dollars or Wild Cat Feature. You will be asked to pick from three icons on the screen to expose either the Doggy Dollars, the Wild Cat, or the Random Riches feature. During the Random Riches Feature you can receive 7, 10, 20, or 50 free spins. All prizes will be doubled multiplied by 6x for winning groupings that include a wild. All scatters will act as additional wilds. Once again, 10 free spins will be awarded when three or more scatter Dogs or three or more scattered Cats appear. 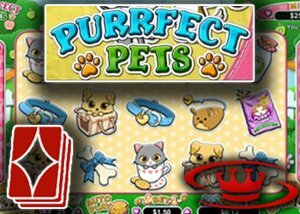 The Purrfect Pet Slot is available at all RTG casinos now and if you'd like you can test your gaming skill by playing Free RTG No Deposit Bonus Slots right here. As a recommended online betting review site we encourage you to check out the amazing Le Bon Casino below, the number one choice for real money Canadian punters. If you want to indulge in a game of chance we recommend you play your preferred slots at Le Bon Casino. The online entity offers a fantastic welcome bonus to all new clientele. New players can claim the Le Bon bonus which is 100% up to $900 using the bonus code LEBON100. This welcome offer is valid on authorized games only and there are different wagering requirements depending on what you choose to play .Be sure to keep an eye on the promotions page of the website so you don't miss out.